Eighth report in my ongoing investigations of cheese dream-inducing properties. Conclusion very tasty dream suppressant. 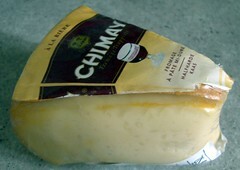 Eating phase for Chimay: 1/6 nights produced dreams. Riding around on buses* in Birmingham, UK, wandering through crowded flea markets watching the shoppers, down alleyways bordered by red-brick Victorian terraced houses in Birmingham. I got lost and didn’t know which bus to get on to go home. So many buses to choose from. Dreaming about buses, England and Victorian red-brick terraces adds up to I had a fabulous dream. Decontamination Phase. 3/3 nights without eating Chimay. No dreams. This scribble was published on Sunday, September 16th, 2007. You can follow any banter on this scribble with the RSS 2.0 feed. You can leave a response, or trackback from your own site.